Mental illness should never be something that is mocked or seen in a negative light. People struggle every day with mental health disorders, and it is this demeaning and destructive behavior and way of thinking that causes individuals to feel shut out. Aiming to eliminate this recognizable stigma associated with mental health disorders is Active Minds, an Office of Student Life (OSL) registered club on campus. The co-presidents for this year are fourth-year psychology major Lilia Goldenberg, third-year psychology major Melissa Boomer, and fourth-year psychology and communications double major Carly Chianese. Active Minds is a national organization, now international with a chapter in Australia, that was started by Alison Malmon in 2003. When her brother Brian took his own life, she decided to start a chapter at the University of Pennsylvania to spread awareness about mental health. There are chapters across the nation, and though it is not limited to colleges, the focus is to start these chapters on college campuses. The club educates their members about mental health and encourages discussion that is generally considered “unacceptable” in a public setting. By beginning with college students and these small meetings, they hope to create a discussion that goes outside of the meeting space. Goldenberg said that there has even been a study done that proves that Active Minds reduces the stigma in their members. Everyone is encouraged to attend Active Minds meetings; the club is not only geared towards psychology majors. 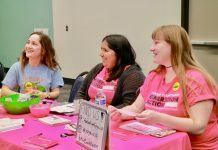 Another aspect of the club is to connect students with other campus organizations, some of which include Health and Wellness and Counseling and Psychological Services. The Disabled Students Program (DSP) also consults with Active Minds as needed. There is no reason mental illness should only be talked about in a private setting, and to push the boundaries, Active Minds will put on an event like nothing they have hosted in the past. Held in collaboration with Associated Students and the Commission on Student Well Being, “Stigma Free UCSB” will be held in Storke Plaza on Thursday, Nov. 13 from 12 to 5 PM. There will be booths from student organizations of all backgrounds, not just psychology-based clubs, that wish to show their support of a stigma-free campus. The first part of the event will be a mental wellness fair from 12 to 2 PM, with activities and games, such as Tai Chi and yoga. The second half will feature a TED Talk presentation and panel from community members who will share their knowledge and stories. A meditation leader will wrap up the event, so that the participants can relax and reflect. Everyone is encouraged to attend the event, and all are welcome to join the club. Active Minds meetings are held on Tuesdays at 7 PM in the Student Resource Building in the OSL Conference Room.